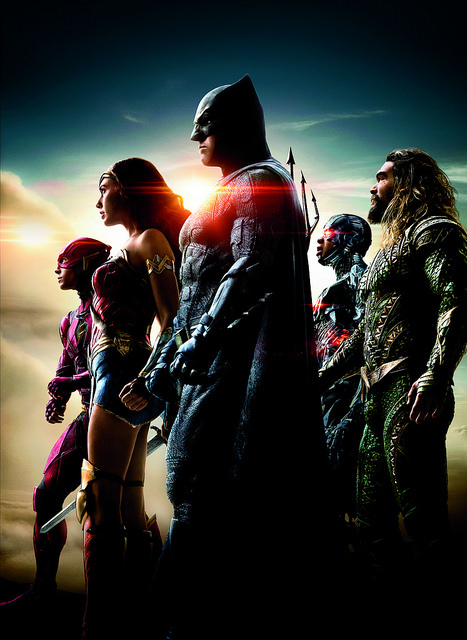 While this summer’s “Wonder Woman” smashed through the box office with a triumphant showing from Gal Gadot, “Justice League,” the latest installment in DC’s cinematic universe, sought to bring about a new era of superheroes to the big screen. In the aftermath of “Batman v. Superman: Dawn of Justice,” the world is in peril. Superman [Henry Cavill] is dead and buried and parademons are kidnapping innocent civilians left and right. Meanwhile, the vicious Steppenwolf is wreaking havoc from Themyscira to Atlantis in pursuit of the all-powerful Mother Boxes – three cubes that, when unified, will unleash untold havoc on the world. Without digging too much into the nitty-gritty details of the plot, it goes to show that a world without Superman is certainly a vulnerable one. By the time the Man of Steel makes his return from the grave, we see a different side of the Son of Krypton. While he does have the lingering issues of resentment towards Batman [Ben Affleck] thanks to events of their previous film, Lois Lane [Amy Adams] eventually brings Clark back down to Earth, calming him before he goes to save the world. It was so odd to see Superman being cocky and even cracking the occasional one-liner before sending Steppenwolf flying through the air with a single punch. But hey, if it makes Superman fun to watch, I’m all for it. Batman, on the other hand, is still as gritty as he was before, but it makes a difference this time around. He’s actually feeling guilt for inadvertently causing the death of Superman in his eyes. After the twenty years he’s spent defending Gotham (in this adaptation, at least), he’s looking worn down compared to some of the other heroes in the League. Wonder Woman, even after Superman returns, still serves as a spiritual leader within the League, which still shows that Gadot is one of the best things to happen to this franchise. “I work with children,” she jokingly says after Cyborg and Superman laugh off their pain after pulling apart the Mother Boxes. Not to mention, Wonder Woman’s musical theme is epic, but that goes without saying. Cyborg, played by New Jersey native Ray Fisher, was one of my favorite parts of this film. While his creation is also tied into the Mother Boxes that his father used working with Star Labs to rebuild him after a terrible accident, he gets so much more depth by doing so. True to his character, Victor Stone shows conflict and depth because of his ever-changing technological body that he’s struggling to find balance in between being human and being Cyborg. The Flash, being the more youthful of the League in this adaptation, was a welcome sense of humor that DC needed with its movies. Ezra Miller’s portrayal gives Barry Allen the sense of inexperience that he hasn’t gotten involved with crime-fighting nearly as much as his CW portrayal, but his slightly comedic and kind-of-a-spazz personality make for an enjoyable ride all the way through. He’s certainly not Grant Gustin, but he’ll do, especially come 2019 when he gets his own film. Aquaman [Jason Momoa], much like Wonder Woman before him in “Batman v. Superman,” is shrouded in mystery, given not nearly as much screentime as Cyborg or even the Flash to flesh out his character. After Steppenwolf attacks Atlantis, he does get the chance to flesh out his character with fellow Atlantean Mera [Amber Heard], but not much else save for accidentally showing his true feelings when he sat on Wonder Woman’s Lasso of Truth. I guess we’ll have to wait until his eventual solo film in 2018, then. In terms of villains, Steppenwolf definitely wasn’t the greatest by superhero standards, let alone by DC standards either. While the newly formed Justice League definitely needed some sort of disposable bad guy to unite them and bring Superman back, he could have used some work. Or at the very least, more explanation as to why he’s running around with ultra-villain and divine being Darkseid’s signature henchmen, moving beyond just the simple name drop to tickle comic book readers’ fancy. While Zack Snyder stepping down may have been to the benefit of Joss Whedon as he took over for reshoots of “Justice League,” this film at the very least is another step in the right direction for DC. With one of the final scenes showing them finding a location to build the iconic Hall of Justice, this shows that there are only bigger and better plans for DC’s cinematic universe. “Justice League” was definitely not the same quality as Marvel’s “Avengers” for the sake of a superheroic comparison, but going forward it can be what DC needs to get moving in the right direction from here on out.